What's the Difference Between the Terms Donation and Adoption? Sometimes words are most easily clarified by looking up their definition in the dictionary. Typically, placing or donating parents tend to use the term 'donation', while receiving or adopting couples tend to use the term 'adoption'. The basis for this is largely psychological. Donation is used in the sense of 'giving a gift' and offers an emotional separation from the embryos that the phrase 'placing for adoption' does not. DONATION: The act by which a person voluntarily transfers the title to something of which he is the owner, from himself to another, without any consideration, as a free gift. The act of giving or bestowing. Yet for the family wanting to parent the children born from such a gift the term 'adoption' makes more emotional sense. They will be giving birth to a child. Adoption is the term that both legally and socially explains the transfer of parental rights associated with a traditional adoption. Adoption also helps to describe and explain to the child the way in which they joined the family, since children are 'adopted' rather than 'donated'. Adoption processes provide you, the adoptive family and the children with social/emotional guidance and support in addition to the medical treatments provided by a fertility clinic. 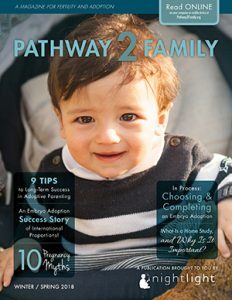 Adoption programs give you as the donating family the option of choosing the receiving family and mutually determining the level of future interaction between families. ADOPTION: The act of adopting, or state of being adopted; voluntary acceptance of a child of other parents to be the same as one's own child. The choosing and making something to be one's own which originally was not.